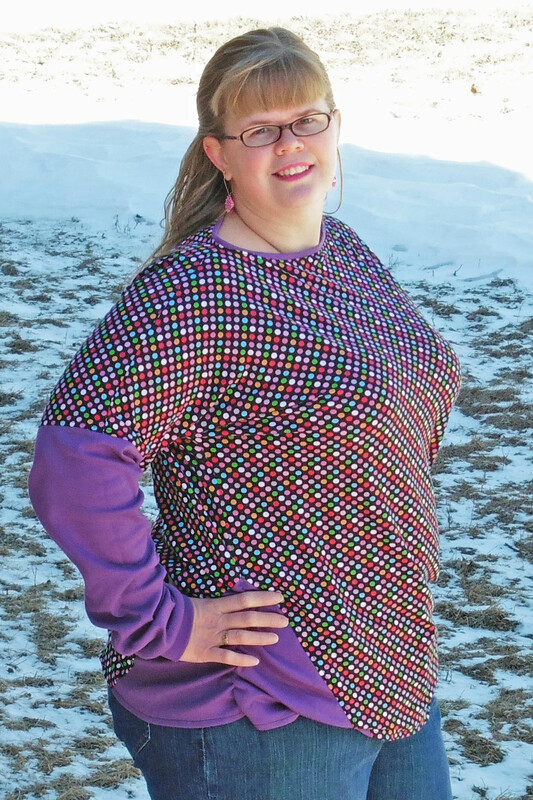 Color Blocking Long Sleeves for Kymy’s Dolman – Everything Your Mama Made & More! So, after hacking the Asymmetrical Drape Top last week, I thought I was done with color blocking for a while. Then I opened my email and had one from Girl Charlee with a “Trend Alert” about color blocking. Who knew that I’d actually be on trend for something?!? As a mom of 5 small children, I’m not sure when it was the last time that happened, haha. 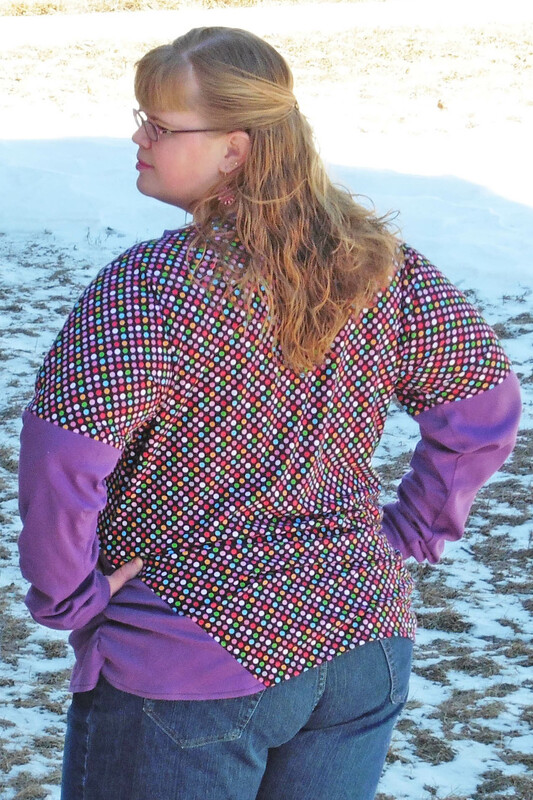 I checked out the photos and inspiration struck me to use a different fabric on just the sleeve, rather than slicing the body of the shirt in two. I pulled out my patterns and noted that the sleeve opening on the Asymmetrical Drape Top was very close to the same size as the sleeve opening on Kymy’s Dolman, so I decided to hack the dolman again. I took the long sleeve extension that I drafted last week and traced it, subtracting the 3/8″ seam allowance along the edge that extends from the shoulder. This is because I planned to cut my fabric with that edge along the fold and end up with a seam only on the underside of the arm. I then added a seam allowance to the edge that attaches to the original sleeve and added a seam allowance to the end of the dolman sleeve when I cut my fabric. I decided to add some color blocked triangles on the bottom side seams, to pull in a little more of the solid purple and to add a little interest to the shirt body. I did this using the same method as the last time I color blocked Kymy’s Dolman. After cutting all the pieces, it was just a matter of sewing them together. 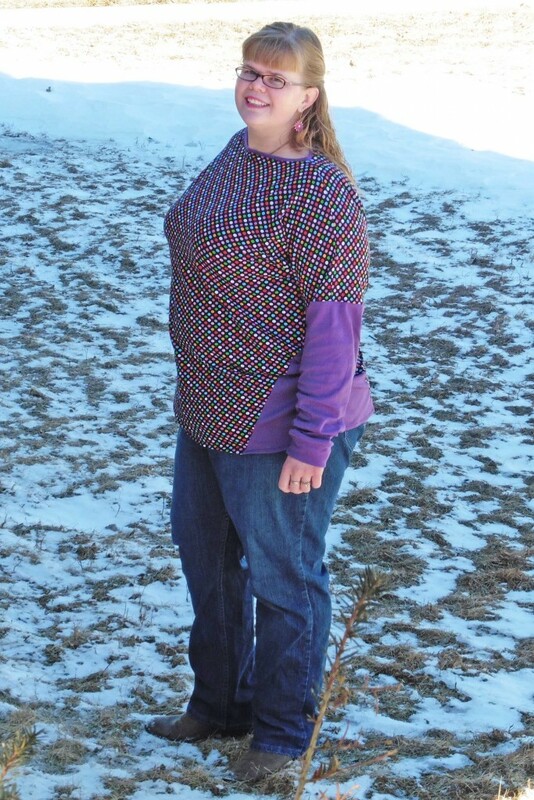 I started by sewing the shoulder seams of my dolman. I attached the sleeve extensions next, making sure to line up the center (which was the fold when cutting fabric) with the shirt’s shoulder seam. I top stitched with the seam allowance pressed up toward the shirt, thinking it would look like a hem on a short sleeve shirt with a long sleeve under it. I added and top stitched the triangular color blocking, then flipped the shirt so right sides were together. I lined up the seams where the sleeve extension started on the underarm and where the front and back triangles met on the side seam and pinned them well so they wouldn’t shift. I sewed from wrist to hem in one long seam. I pressed the hem up to the wrong side and stitched it in place. I added cuffs to the wrists and a narrow band around the neckline because I prefer the banded look. Finally, because I’m in love with how View D camouflages my post-5 baby tummy, I ruched the side seams with elastic and my top was finished!